I think most Steve Hunter fans know how wide his taste in music is; his solo albums are usually a mix of Rock, Blues and atmospheric melodic pieces. In the past he has worked on records for Tracy Chapman and Julian Lennon who are both a long way from the rock charged music of Alice Cooper or Lou Reed. Plus of course the acoustic guitar on Peter Gabriel's 'Solsbury Hill' is in itself a testament to Steve's versatility. That's why it will be no surprise that he has produced this wonderfully gentle, reflective chillout music on our new collaboration under the name 'Rue La Mer'. We started this project back in 2010 then a world tour with Alice Cooper cropped up and off we went for a year. But we always knew we would eventually get back to it. This music allows Steve to experiment with the countless pedals he has in the studio, work with different tunings and instruments and most importantly to make peaceful music, which has become a passion for both of us. It also keeps me singing and writing. We are both big fans of the European Chillout label 'Cafe Del Mar'. Not widely known in the US, this genre of music emerged after the creation of the 'Balearic Beat' and became the sound of Ibiza for clubs and coffee houses on the coast of the Mediterranean Sea. 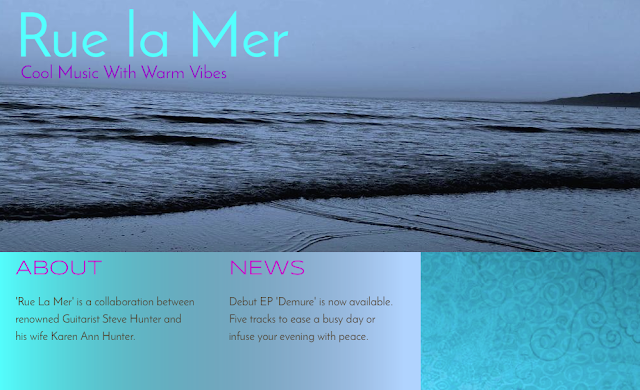 Our first release under the name 'Rue La Mer' (Street Of The Sea) is a five track download only EP called 'Demure'. It has three vocal tracks and two instrumental tracks. I think this project allows Steve to shine on his production skills, a lot of which he credits to legendary record producer Bob Ezrin, after spending so much time in studios with him over the last 40 years or so. The music is relaxing but not sugary and of course it has Steve's talent on guitar all over it, although there is actually no guitar on the title track. 'Demure'. We are currently working on the next five tracks, which should be available before the end of this year. We will have two tracks from this first EP on the playlist for the 'Women Of Substance' radio station, the first 'Shades Of Blue' will air on Show #254 November 10, 2015 . The second will be 'Don't Ever Lie' about three weeks later.